Read our 2014 posts right here! 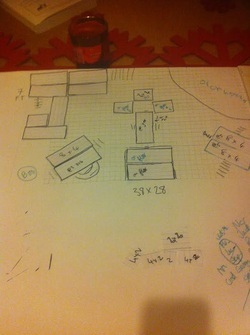 So, Rob and I sat down with a pencil, a large sheet of paper, a dodgy ruler and two cups of coffee ..... set designed. Boom! Ok ... one more person to cast - who can be Rapunzel's Prince? Let us know! Fabulous Intro The Woods session today .... if you want to audition, get in touch! That's another curtain down on another incredibly successful show -- Thanks to all who supported the show! 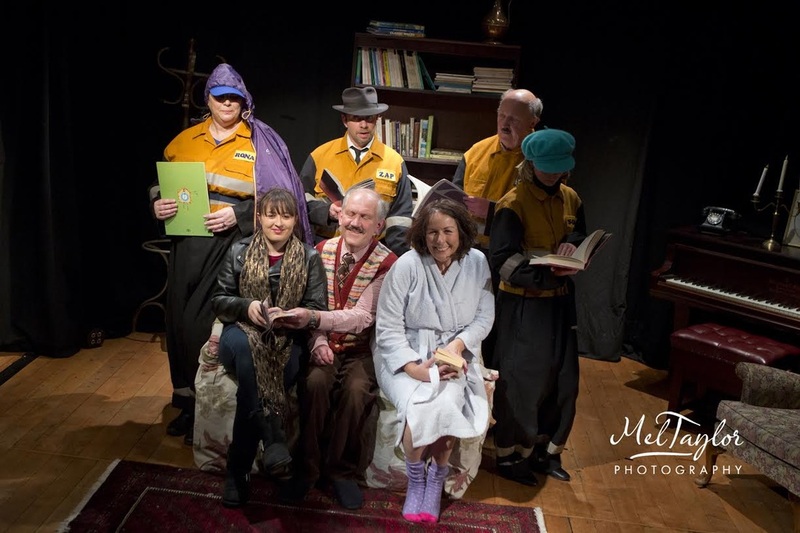 After a fabulous opening night, the AmEgos are looking forward to the second showing of Improbable Fiction. The wine flowed, the laughter rang out... and no one fell into the pool! Here's to the next two nights! 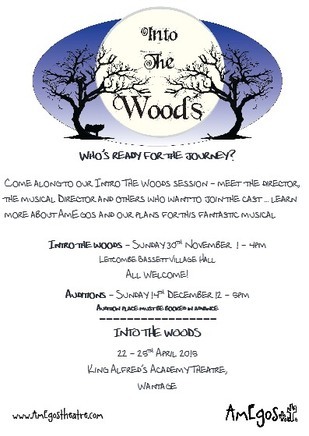 AmEgos announce an Intro the Woods session on Sunday 30th November 1pm at Letcombe Bassett Village Hall ... come along! 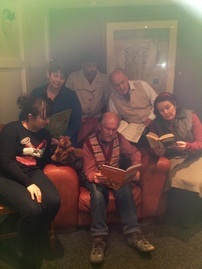 The Imp Fic cast are taking rehearsals far too casually! 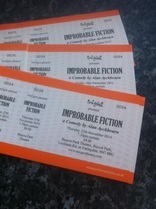 Getting calls and emails from people who want tickets for Improbable Fiction -- so sorry to disappoint you. we are working very hard to get any returns out to people who have contacted us. 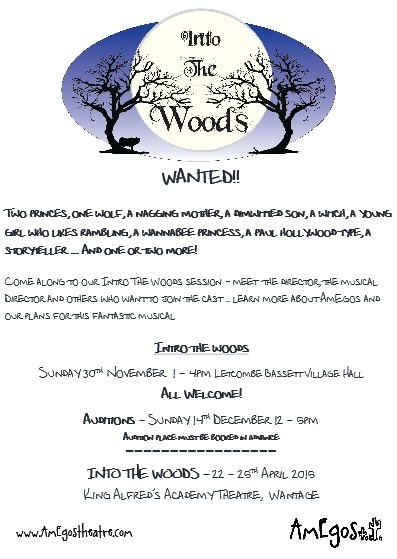 There are 20 parts, big and small, to be cast so we are holding an introduction to Into the Woods on Sunday 30th November, 1 - 4pm at Letcombe Bassett Village Hall and then we will hold auditions on Sunday 14th December, 1 - 5pm again at Letcombe Bassett Village Hall. 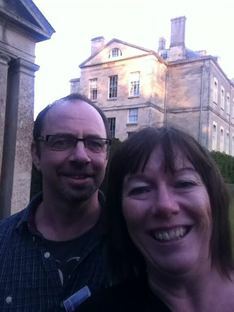 We had a sneaky visit to Buscot Park Theatre today .... EXCITED! Rehearsals are in full swing for Improbable Fiction and we are THRILLED to announce that we will be performing in the fabulous theatre at Buscot Park --- now you HAVE to come! The cast for Improbable Fiction are in place .... details will shortly be posted on the show page! Fantastic first read through, with some familiar faces and new friends! And we all seemed to keep up with the remarkably quick changes of characters in the second act! For those that couldn't make it ... we have a second read through on Thursday 17th July, 7pm at Childrey Village ... I promise it will be just as exciting as a meeting of the Pendon Writers circle! A play for the autumn! 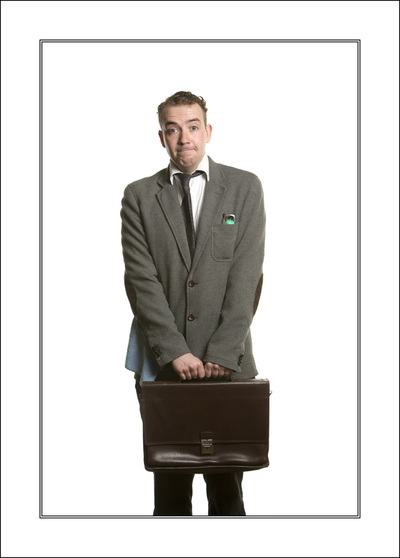 We plan to produce Alan Ayckbourn's comedy play IMPROBABLE FICTION this autumn. So, that's a wrap. A fond farewell to Max, Leo, Franz, Roger, Carmen, Ulla and all the gang at The Schubert Theatre! Our most successful production to date .... here's to the next one! 9 days to the opening of The Producers and we're all working sooooo hard! 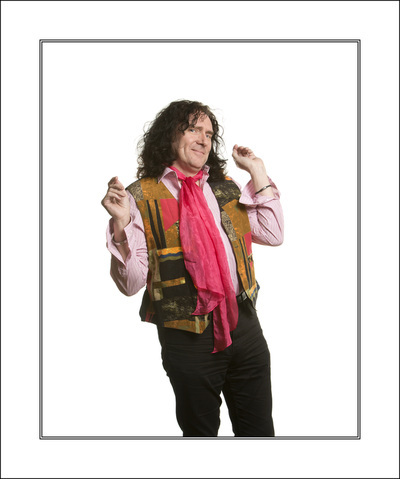 musical is told in a show coming to Wantage. Saturday, May 7 to 10. 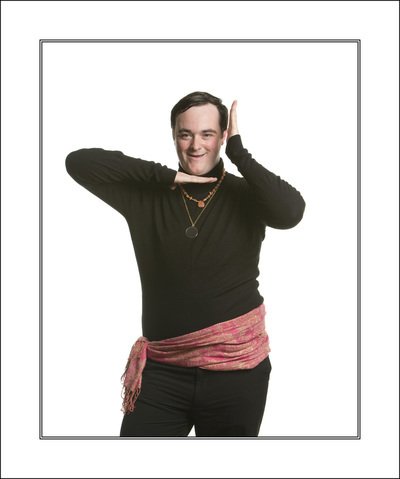 He teams up with Leo, who always dreamed of being a theatre producer. Winskill as the director Rodger De Bris and his assistant Carmen Ghia. Anderson also plays secretary Ulla. 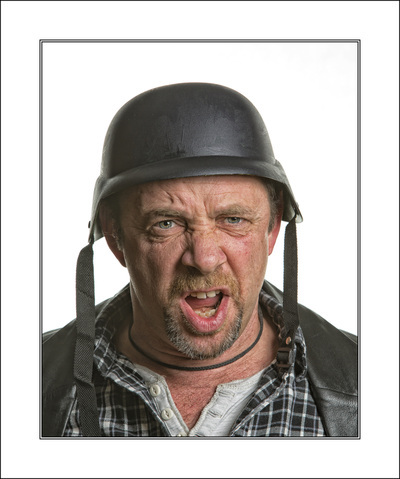 The musical director is Michael Dukes. and that helps towards the cost of putting on such a show. Woods in Faringdon or Umami Deli in Wantage. Spent most of today tidying up the website ... hope you like it! Found this little film of the first time we sang through Opening Night, way back in September 2013 ..
You'll have to come and see the show to see how it sounds now! 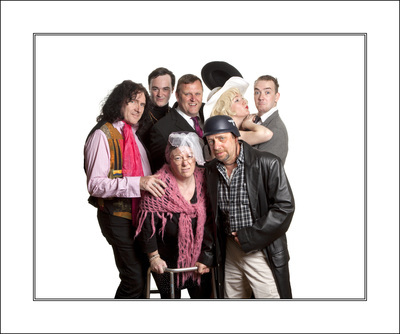 The fabulous folk at Chariots and Cherry Pie have agreed to take an advert in our The Producers Programme - Yay! www.wegottickets.com/amegos right now. Offer lasts until end of Easter Monday! Friends of AmEgos, L & C Cannings of Challow, have agreed to be our SILVER sponsors for The Producers ... we are really lucky to have such kind supporters. Thank you! 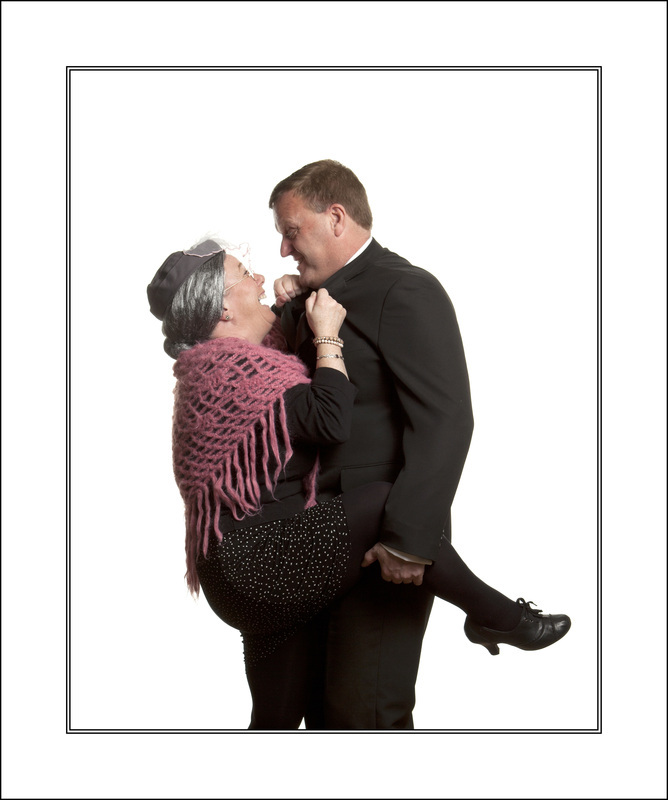 Grace made two fabulous promos for The Producers following our photoshoot .... enjoy! 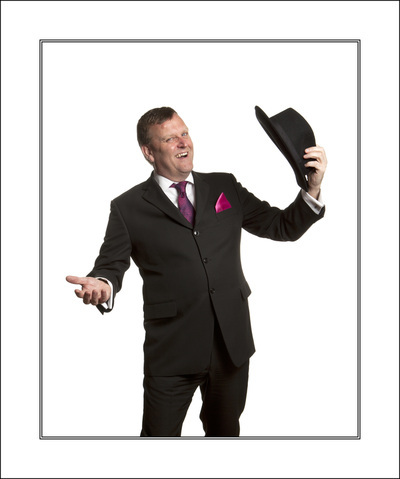 We are thrilled to announce that the fabulous folk at The Snooty Mehmaan are to be our PLATINUM sponsors for The Producers ... HOORAH! Rob, Grace and Lesley visited the fabulous John Gale at King Alfred's Academy today to talk about the set ... we found this ... AND we're going to use it in The Producers, but for what??? Whilst we've been working very hard on our rehearsals for The Producers, we've still found time to organise a pub quiz! New Year's Resolution - get involved with fabulous local theatre company! Come and join us for our next show, Mel Brooks' hilarious comedy musical THE PRODUCERS!